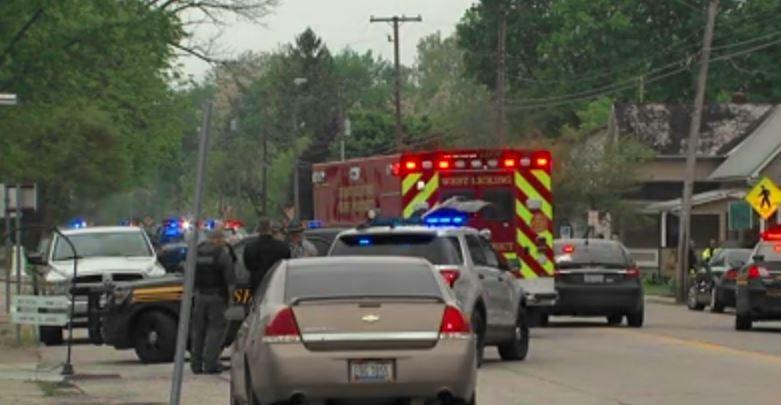 KIRKERSVILLE, Ohio -- An Ohio police chief was fatally shot by a gunman who then opened fire in a nursing home Friday morning, killing two others before turning the gun on himself, reports CBS affiliate WBNS. Ohio State Highway Patrol Lt. Robert Sellers says that the situation has ended and there is no threat to the public. The slain police chief, Steven Eric Disario, had headed the Kirkersville Police Department for only about three weeks, Licking County Sheriff Randy Thorp said. Disario was shot on a street near the Pine Kirk Care Center, and the two female employees and the gunman were found dead inside, Thorp said. Disario, 36, was a father of six children, with a seventh on the way, the sheriff said. Flowers and flags appeared in an impromptu memorial outside the village police hall, located less than a block from the site of the shooting. "It's a hard day for all of us," Thorp said. Police say the gunman was in a wooded area behind the nursing home when he encountered two passers-by, whom he temporarily took hostage, Thorp said. Disario, responding to a report of a man with a gun, apparently encountered the gunman in that area. The chief's last radio communication said he had the man in sight. When a shot was fired at the chief, the hostages escaped unharmed. "We don't know the cause or the purpose or what drove this individual to do this," Thorp said, adding that was being investigated. Responding officers found Disario on the street and then investigated a report of a gunman at the nursing home, Thorp said. Two employees of the center, both women, and the suspected gunman were found dead inside the nursing home, the sheriff said. A local elementary school was put on lockdown, and parents were later told they could pick up their children at a nearby middle school. The shooting closed down the main street in the village, which was flooded with police officers from several surrounding agencies and with ambulances. The village of about 500 residents is roughly 25 miles east of Columbus. The Pine Kirk Care Center is licensed for 24 patients and had 23 as of May 3, according to Ohio Department of Health records. A message was left with the center. The state Bureau of Criminal Investigation is leading the probe into what happened. Search warrants were being executed on the shooter's car, found at a nearby truck stop, and his home in Utica, the BCI says. Officials didn't immediately identify the gunman.